Mallard is and always been, family owned. Started by Jack Wahl (of Wahl Clipper) in 1960, Mallard is now owned by Mike Gunderson and Kevin Risch. Under their leadership, Mallard has earned a reputation as the market leader in Pallet Flow Racking, Carton Flow Rack and Gravity Flow Conveyor Systems. What’s the Real Mallard Difference? The answer is simple, reaching well beyond the quality of our products…. It’s our team! With over 120 dedicated full-time employees, our responsibility is to solve your storage and material flow challenges each and every day with pallet flow racking, carton flow rack and gravity flow solutions. 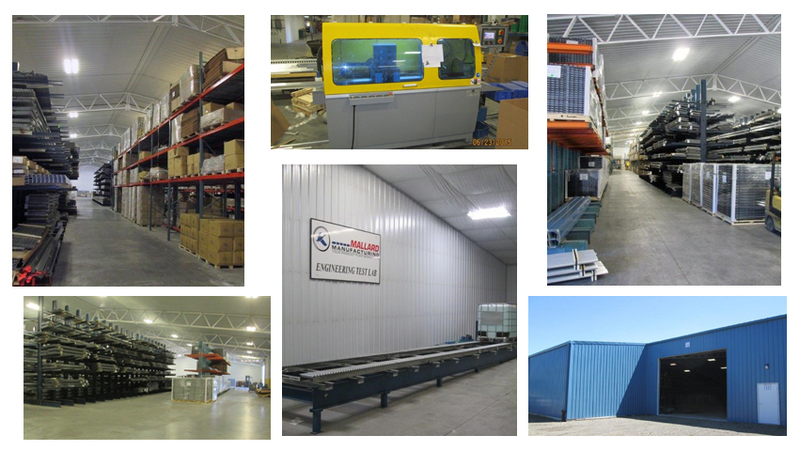 Each project, large or small, is supported by Mallard’s sales, engineering and design teams who have the most extensive and specialized product expertise in the industry. We support an extensive integrator and distributor network throughout the world providing value-added engineering and sales support from our recently expanded 150,000 square-foot facility in Sterling, Illinois. Expanded 55,000 sq. ft. for a total 150,000 sq. ft.
We’ve created an in-house testing lab to ensure our systems not only stand the test of time, but the rigors of the toughest applications and warehouse conditions. We’ll test your pallets within the specified lane design to ensure flow rates, pitch, pallet quality, pallet spacing and speed controllers. A complete pallet flow racking test report and video are prepared to ensure full satisfaction before moving the project forward.